Succulent and tender new season Welsh lamb, cooked to perfection and served with a simple vegetable curry - ideal for a midweek supper. Wash and quarter the new potatoes. Place in a pan and cover with cold water. Bring to the boil, then simmer for 10–12 minutes until just tender. Drain well. Heat the oil in a deep frying pan and sauté the onion for 4–5 minutes until starting to soften. Add the curry powder and tomato purée and cook, stirring continuously for 1-2 minutes, being careful not to let it burn. Stir in the chick peas and drained potatoes together with 250ml cold water and some seasoning. Cook for 2 minutes, then add the spinach and cook for a further 5 minutes to allow the curry to thicken and reduce a little. Meanwhile, preheat the grill to a medium heat and cook the lamb steaks on a grill rack for about 4–5 minutes on each side, depending on how well-cooked you like your lamb. 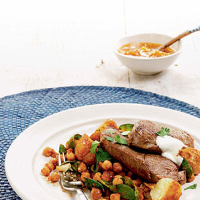 Serve the curry and lamb steaks with natural yogurt, chutney and a scattering of chopped fresh coriander. Try the chick pea curry alone as a vegetarian dish or accompaniment. The lamb steaks taste great when cooked on the barbecue too. Grilled lamb is great with a robust red. The Pizzorno Merlot/Tannat 2006, Uruguay is a sturdy wine, but nicely rounded-off with the Merlot in the blend.